ADS stands for Automation Device Specification. 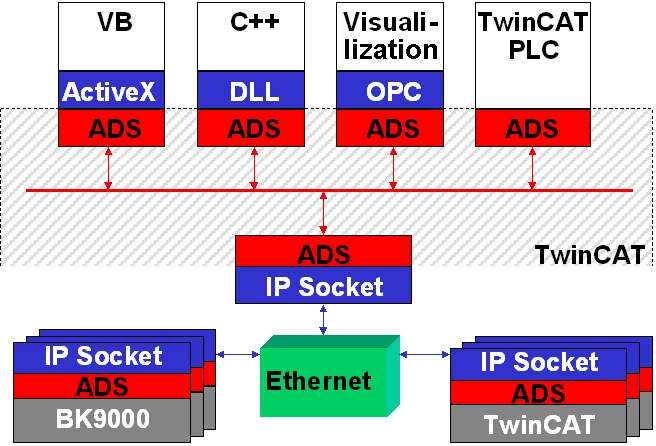 The ADS protocol (ADS: Automation Device Specification) is a transport layer within the Beckhoff TwinCAT system. It was developed for data exchange between the different software modules, for instance the communication between the NC and the PLC. This protocol offers the freedom of using other tools to communicate with any point in TwinCAT. If it is necessary to communicate with another PC or device, the ADS protocol is used on top of TCP/IP. This means that in a networked system, all the data is accessible from any desired point.